I've just come back from another successful trip with my good friend Jon Cornforth. Together with other friends, we photographed humpback whales engaged in bubble net feeding. More on that later if I can get my act together before heading out again. While I was away, an article I wrote about a spectacular aggregation of sperm whales appeared on bioGraphic Magazine, an online publication run by the California Academy of Sciences. I did my best to make the text informative while still being engaging, incorporating historical information and key insights from recent research, as well as snippets based on personal observation. Sophie Stafford's advice and excellent editing was invaluable in this regard. Thank you! 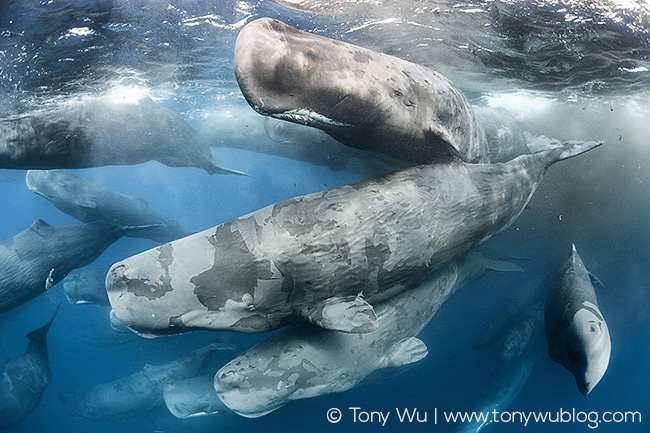 If you're interested in sperm whales, please click over to the bioGraphic site to see the photos and story. If you have the time and inclination, I'd ask that you read the entire text, especially the box at the end.